This plumeria cake was made as a wedding cake for my sister's wedding. I made this three tier cake with cascading plumerias. 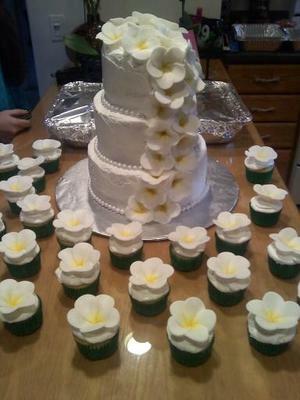 The plumerias were made with a teardrop cutter and fondant. They were then painted with edible yellow dust. To make the plumeria flowers, you need 5 petals cut with the desired size of teardrop cutter. You layer the petals on top of each other spaced evenly apart and twist the bottom to a point, then you let them dry. I put them on egg cartons to dry. After they are dry you paint the center with dust in the color of your choice. After my cakes were made and stacked, I pushed the twisted bottom of the flower into the cake. With the leftover flowers I decided to make cupcakes and use the flowers on the cupcakes. This was a fun cake to make once I figured out how to make the flowers! Return to January, 2013 Cake Decorating Contest Submission Form.